Are you into adventures on the high seas and pirate shenanigans? If you answered yes, Daughter of the Pirate King is a young adult fantasy novel that you must check out. It’s the tale of teen pirate captain Alosa, who deliberately allows herself to be captured by her enemies to infiltrate their ship and search for the piece of an ancient hidden map that leads to extraordinary treasure. Faced with pirate ruffians, a handsome first mate and a rather large ship to search, Alosa must rely on her wits and her skills to complete her mission. Alosa is a major reason I adored this book. She’s quite capable at both diplomacy in sticky situations and handling a weapon when she needs to put up a fight. She’s clever, sassy and fiercely loyal to her crew, unafraid to dirty her hands when necessary but also unwilling to stand for injustice. I admired her greatly (to the point where I just wanted to be her). It was fun to see her develop a rapport with unlikely individuals among her captors, sweet to watch a romance blossom and interesting to see her relationships with the members of her own crew. Though the relationships could have used a touch more development, I still thought they were core to revealing more about Alosa in this story. This novel is one heck of an enthralling ride, and I relished it all – the banter, the thrill of Alosa’s secret mission and her near misses, the romance, the battles. 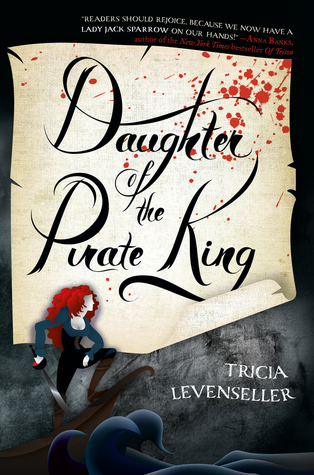 I’m thrilled that Daughter of the Pirate King was so enjoyable, and I look forward to catching up with Alosa and company in the next book.